Executive chef Kevin Korman poses inside the dining room at The Edwin hotel. He has created a "progressive Appalachian" menu for the new hotel's main restaurant, Whitebird, as well its rooftop bar, Whiskey Thief. 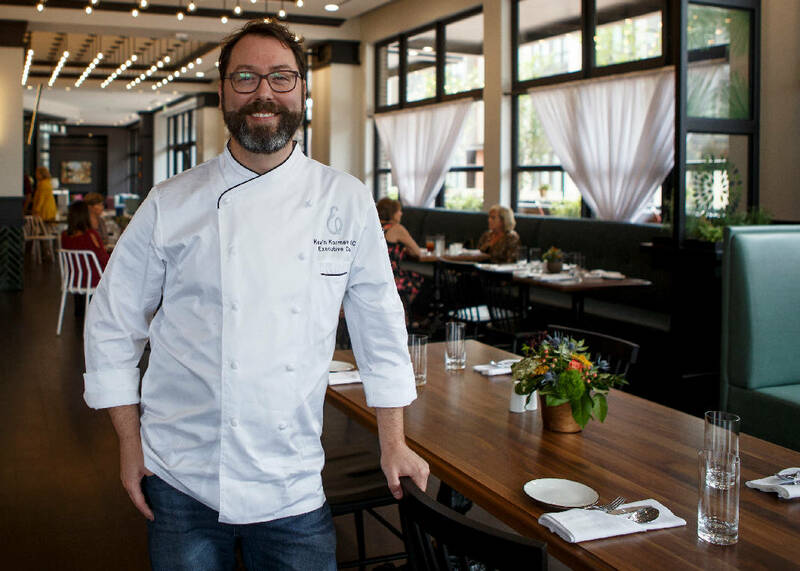 Kevin Korman, executive chef at Chattanooga's exciting new hotel The Edwin, received his degree in the culinary arts from Baltimore International College in Maryland and completed an honors internship in County Caven, Ireland. But his training began before that — long before. His mother and grandmother were both excellent cooks, the latter a professional cook at a Catholic school. His brother owns a barbecue shack in Maryland, where his mother helps out on occasion. The Edwin Hotel, on a prime piece of property at the south end of the Walnut Street Bridge overlooking the Tennessee River, has two dining venues. On the main floor is Whitebird, where Korman designed a menu with inspiration from his Appalachian grandmother. On the top floor is an amazing rooftop bar, Whiskey Thief, where you can order a drink, along with casual fare, and take in one of the best views in the city. Here he talks about his favorite Thanksgiving dish, his odd first job and what he considers the best part of any meal. A: I remember being in my grandmother's kitchen while she was cooking every time we visited her. She lived in the tip of the Appalachian Mountains in Maryland, and we lovingly referred to her as "Mommom in the mountains." I have vivid memories of her butcher-block table and soft music playing while she cooked. Q: Whom do you consider your mentor? A: I trained with chef Rudolph Speckamp for four years when I was a young cook. He was a certified master chef, and I can still hear him in the back of my mind when I'm in the kitchen. He instilled in me a love for classic techniques and a strong work ethic. Q: Do you think it's important for a chef to have a degree? A: I think there are different paths a chef can take and different methods of learning. Culinary school gives a good base knowledge of ingredient identification and culinary terms. However, there is no substitution for working side-by-side with a great chef in the real world and in the heat of the kitchen. Q: Some hotels have a tough time bringing in locals to dine at their restaurants. What are you doing to ensure that local diners will become regular patrons? A: We are building the culture of The Edwin with a goal to connect both travelers and locals to our city. We often refer to ourselves as a food-and-beverage operation with 90 rooms attached. We want to ensure that people understand that Whitebird and Whiskey Thief are open to anyone. Q: Describe your menu. What's different about it from other places in town? A: Our cuisine is defined as progressive Appalachian. We are showcasing the bounty of ingredients of the Tennessee River Valley, while paying homage to the recipes and techniques that are rooted in Appalachia. Q: What were you striving for when you created the menu? A: I like to take the approach of creating a menu that is familiar, while including elements of surprise and delight. My philosophy is that if a guest is coming to dine with us and chooses to pay for a meal that we created, they should walk away feeling like it was worth it. They should feel like they ate something that they could not have prepared on their own. Q: What do you think about food trends? A: I believe it's important to know what's popular in the culinary industry. For one thing, this is a business, and if something is selling well, then it is selling well for a reason. We prefer to take unique approaches to our dishes and certainly don't want to duplicate what someone else is doing. I would say the trendiest dish on our menu is our avocado tartine — crushed avocado, Calabrian chilies, mint, pickled peppers with a crispy quinoa/sunflower seed crunch. It's our take on avocado toast, which is very trendy. Q: Does your menu change often? A: We'll be changing our menus with the seasons and plan to have nightly specials. The most exciting program we will have is our Chef's Table. We have plans to roll out a 10-course tasting menu with limited seating for 10 guests, cooked by me personally. It'll be an interactive experience that will hopefully be on everyone's must-do list. A: I used to make false teeth as a job when I was in high school. Q: What cooking tool can you not live without? A: A variety of spoons. I probably have too many, but they all have their own unique shapes that are great for different applications. A: Cheetos. No judging please. Q: How do you spend Thanksgiving? A: Most of our family lives out of town, so my wife and I prepare a huge traditional spread for just us and our children. Q: What's your favorite part of the meal? Q: What's your favorite Thanksgiving dish? A: Saltine crackers crushed up and mixed with Thanksgiving gravy till it's almost the consistency of stuffing is a Korman tradition. It's a little bizarre but reminds me of my childhood. But there's also Autumn Succotash. It's typically made with corn, squash and beans, but I make it with butternut squash, black-eyed peas and Brussels sprouts. Cook the bacon in the olive oil until crispy; add the vegetables, herbs and stock, and cook for 5-6 minutes or until vegetables are tender. Season with salt and pepper. Makes 4 servings.